The BUG was designed specifically for multipitch,long routes that are done in a single day. Its rounded rectangular shape maximizes volume and minimizes interference while in use. The volume of the BUG is ideal for carrying gear on the approach and when climbing (hydration system, guidebook/topo, clothing, shoes, etc). 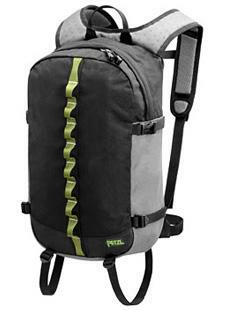 Everything has been designed for maximum comfort while climbing with the BUG on the back: minimal bulk, shoulder straps allowing freedom of arm movement, comfortable and ventilated back panel, foldaway waistbelt, high positioning allows access to back of harness(for chalkbag, gear) and lateral compression straps. Astute design includes a guidebook pocket on the outside for quick and easy access, attachment loop for an e+LITE (emergency headlamp), zippered mesh pocket with key clip, small pocket on the shoulder strap for a topo map, as well as being hydration system compatible.